It looks like summer is finally here. It’s time to enjoy the beautiful weather, spruce up the garden, eat delicious fruits and vegetables, and…get that compost pile started! Saving you money and reducing toxicity by decreasing the need for expensive chemical fertilizers and pesticides. Improving your garden as it enriches soil by helping to keep moisture in, and pests and diseases out! Lowering your carbon footprint as waste is diverted from landfills, therefore reducing methane emissions. Composting isn’t difficult; anyone can do it! Getting your compost pile started, and keeping it going, just requires the right mix of ingredients and a little bit of time. The composting process can be decomposed into four simple steps, follow them and you’ll be on your way. And once you use some finished compost in your garden, you’ll know why gardeners call it “black gold”. It all begins with a bin! 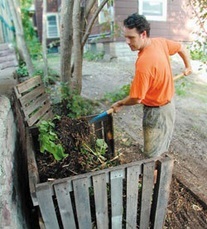 The first step toward a successful compost pile is getting the bin where you will put your compost ingredients. When it comes to the bin, you have lots of options. 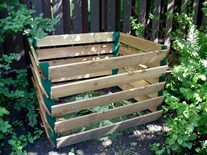 You could build your own bin using these instructions from the MPCA or look online for other designs. There are also numerous compost bins you can purchase online or in your local gardening store. An ideal size is about one cubic yard (3’ x 3’ x 3’), as it is a manageable size for residents and will still retain heat. Be sure to check with your local municipality for any specific backyard compost rules on size. The right mix does the trick. In order to get the best results out of your compost pile, it is helpful to get the right blend and balance of ingredients. The key compost components are nitrogen-rich “greens” which give the microbes protein, carbon-rich “browns” which give the microbes energy, water, and air. Fulfill your “greens” quota with fresh grass clippings, green leaves, and vegetable and fruit scraps, while the “browns” in the compost pile can come from straw, brown leaves, twigs, and wood chips. To help provide air circulation and proper drainage, start your pile by placing a layer of coarse browns such as twigs in the bottom of your bin. When adding materials to your compost pile you want to have a carbon to nitrogen ratio of 30:1 (by weight), which translates to roughly two parts "green" to every one part “brown”. A part would be a particular volume like a five-gallon bucket, but your “recipe” will somewhat depend on the materials you are using. Don't worry about getting the mix exactly right, as it's very easy to add material to adjust the pile's performance. If your pile is not heating up enough to do much composting, you likely need more “greens”, whereas if your pile starts to have an odor, you likely need more browns. Help your compost go with H2O. The microbes that work to break down your compost pile require water to function. It’s important to keep your pile hydrated but not soaking wet. If you squeeze a clump of compost in your hand and small beads of water form, then your pile is adequately watered. If you do the squeeze test and lots of water drips out, then this is a sign that your pile is overwatered. Turn the pile several times to help air it out and refrain from adding additional water. You can also add dry leaves to help absorb extra moisture. Rainfall, together with the grass clippings, usually provides enough moisture for the pile. Turn the pile, every once in a while. After you’ve created your compost pile, you can leave it up to the bacteria, fungi, and insects to start the decomposition process. Besides adding more materials and checking on the amount of water in the pile, you will need to turn the compost pile over every week or so. This helps aerate the pile and mix up all the different ingredients, which will help all the decomposers continue to work hard to break everything down. Keep turning the pile until it’s complete. You will know it’s done when the finished compost is dark, rich, and crumbly, a far cry from what was originally in the pile! Want to compost but are unable to start your own pile? An increasing number of communities throughout Minnesota now have large-scale composting options that are made possible by source-separated collection. Source-separated collection means that residents and businesses separate the organics out from the rest of the waste. Commercial composting offers communities many benefits, because these facilities are able to accept a greater number of items including non-recyclable paper such as paper towels, and paper cups and plates. Additionally, large-scale composting helps restaurants, businesses, and commercial venues consolidate food waste at a compost facility so that these establishments don’t have to maintain their own compost pile. Large-scale composting is a great opportunity for residents and businesses to take real steps toward reducing waste! So what are you waiting for? Now’s the time to start your compost pile. It’s great for your wallet, your garden, and the environment! Questions about your compost pile? Running into problems? Check out these great resources provided by the MPCA detailing how to start composting. Each spring the Recycling Association of Minnesota teams up with local businesses and governments throughout the state to provide local residents with inexpensive compost bins and rain barrels. Although the Spring sale event has ended for this year, be sure to check back again next year to get a great deal on a new compost bin or rain barrel!